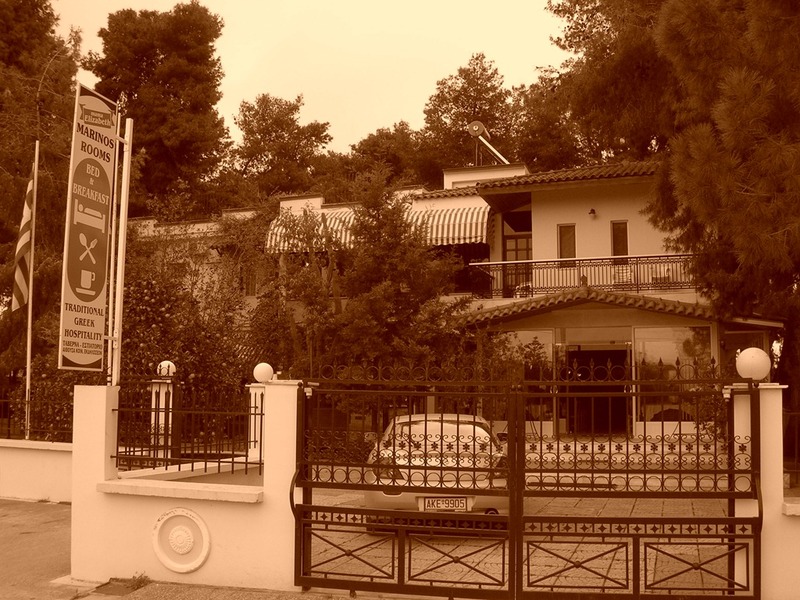 I was saddened to hear the news on Friday about the passing of Spyros Marinos, founder and owner of Rooms Marinos, the quaint hotel on the eastern end of the village of Ancient Corinth. As Bill Caraher commented this morning, Spyros and family hosted, lodged, and fed literally hundreds (or thousands?) of American, Australian, and European professors and students over several decades who had journeyed to Corinth to participate in archaeological work in Corinth, Isthmia, Kenchreai, or the territory. And that is to say nothing about the numerous groups of students, tourists, and cyclists who were simply passing through Corinth on pilgrimages through Greece. I was one of those students who showed up in the village in 1998 immediately after my senior year of college to participate in my first Greek archaeological project. Spyro, Mama Elizabeth, and family delivered warm hospitality, good laughs (some at me! ), and some of the best food I had ever eaten. 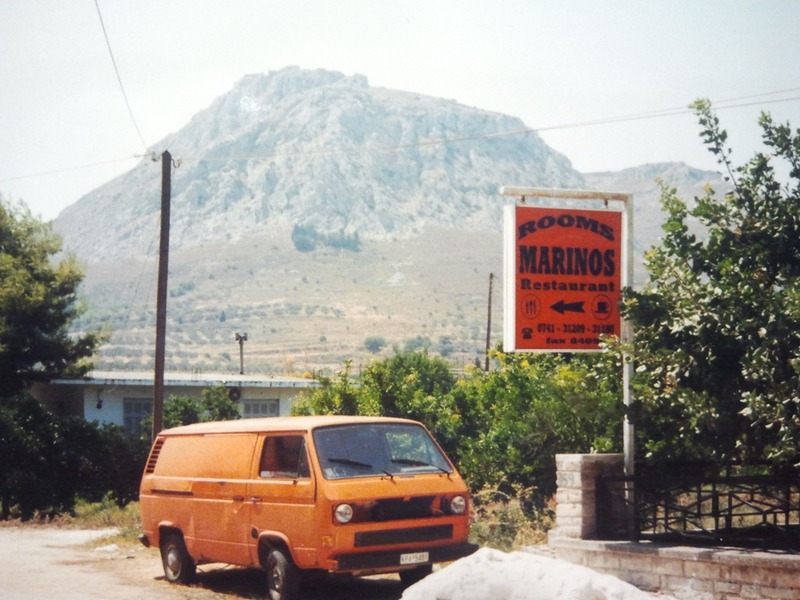 Like others who returned to the village regularly for archaeological work, I became part of the Marinos extended summer family, and Rooms Marinos became my summer home. 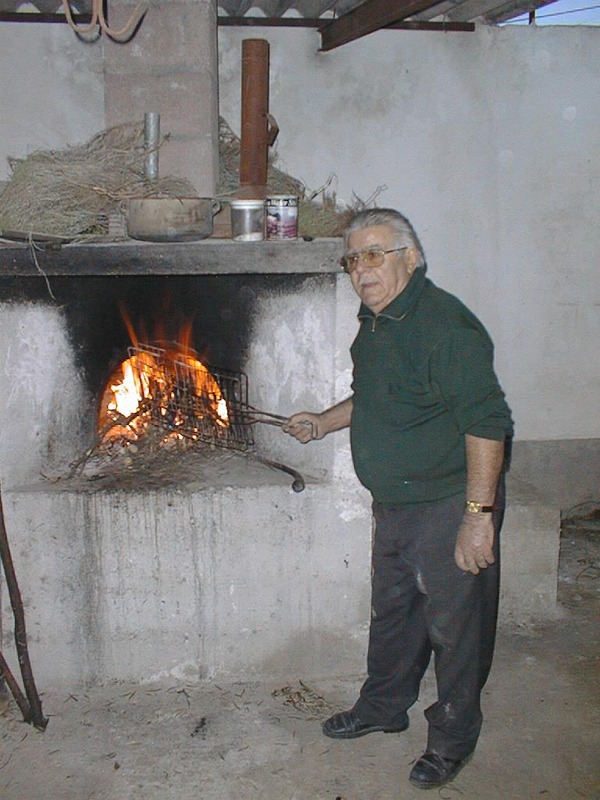 Besides his hospitality and industriousness (so many hours he worked each day), I remember especially Spyros’ dry sense of humor, with jokes delivered in Greek, but somehow understandable through gestures and facial expressions to those without knowledge of the language. Although many students didn’t realize it, he understood English quite well, even as he did archaeology—he was once chief guard of the archaeological museum at Corinth and was retired from the Greek Archaeological Service. But he wanted us to learn Greek and patiently repeated himself until we got it. 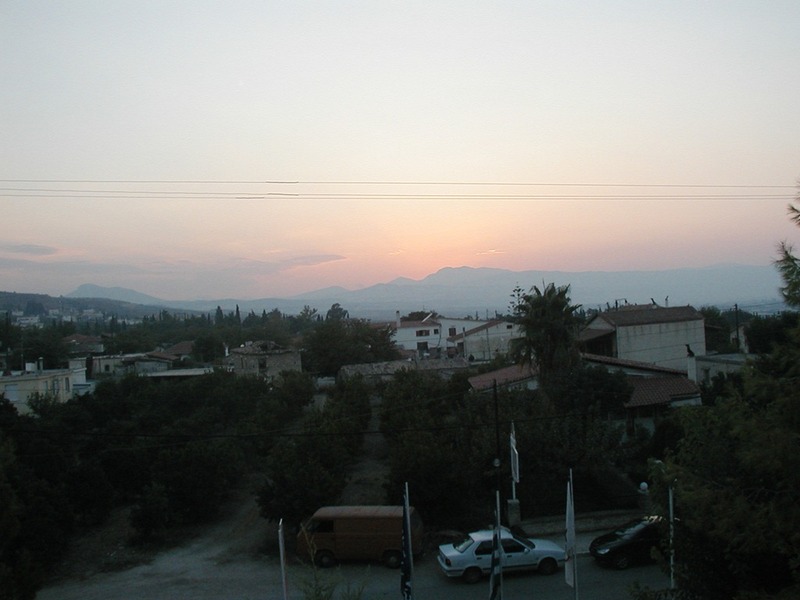 I looked in vain for a good photo of Spyro and family with a group of students, but I could only come up with images of the beautiful place he created in the midst of pine trees and in the shadow of Acrocorinth, with a view to the setting sun over the mountains beyond Sicyon. Anyone who has stayed in Rooms Marinos will greatly miss his presence. 8-11-12 Addition: Colleague Sam Fee has kindly provided some photos (below) of Spyro at the grill in 1997, including the Pascha feast. Marinos’ was it’s own world. And it was where I made the acquaintance of the electric owl! A sad day for all Korinthians. Thanks for passing on the announcement and the breif text and photo eulogy. This was the first year in many that my former professor didn’t travel to Greece, and I wondered how the family Marinos was doing. I spent time there in 1999, 2000, and 2003, and I dearly loved them. The only photo I had of Spyros was lost in a flood of our basement last fall, but the memory of his teasing eyes will live on in my memory. Thank you for this! It’s been many years since I traveled to Greece with my college class and met Spyros. He was very special to me and my class as well.